Fig. 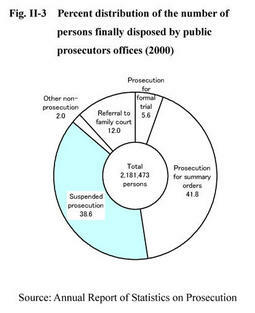 II-2 shows the percent distribution of the number of persons newly received by public prosecutors offices in 2000. In 2000, 1,146,403 persons (52.7% of the total) were newly received for penal code offenses and 1,028,464 (47.3%) for special law offenses. 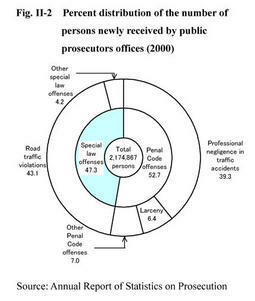 More specifically, 292,522 (13.5%) were received for penal code offenses excluding professional negligence in traffic accidents and 90,904 (4.2%) for special law offenses excluding road traffic violations (see Appendix II-2 ). Persons newly received for professional negligence in traffic accidents and road traffic violations accounted for 39.3% and 43.1% of the total number respectively, which collectively accounted for 82.4% of the total.